Bukowski is back and better than ever! 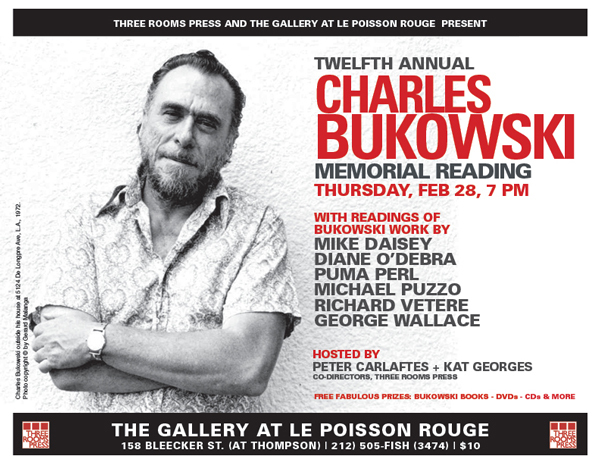 Three Rooms Press will host its annual Charles Bukowski Memorial Reading on Thursday, February 28th in the gallery at Le Poisson Rouge (158 Bleecker Street @ Thompson, NYC). The event features readings of Bukowski’s work by renowned authors and poets and brings to light the enduring relevance of this cult icon. Held annually since 2008, the event will feature performances of Bukowski poems by longtime fans of his work including famed monologist Mike Daisey (The Agony and the Ecstasy of Steve Jobs), internationally-acclaimed poet George Wallace (Poppin’ Johnny), playwright/novelist Richard Vetere(Champagne and Cocaine), playwright Michael Puzzo (Spirits of Exit Eleven), poet Puma Perl (Retrograde), and comedian/performance artist Diane O’Debra. We would be happy to issue press passes or to discuss coverage of this event in your publication. In addition, all attendees will be eligible to win prizes including rare Bukowski audio recordings, videos, photos, and a collection of Bukowski poetry. Admission is $10. Advance tickets (recommended) are available at https://bit.ly/2WazOFf or from the Le Poisson Rouge box office.